Another episode of the Sun and Moon anime has aired! 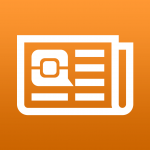 Read up on the events that took place here! In this week’s episode, Lana is training to master the powerful Z-Move, Hydro Vortex. The episode opens with Ash and Mallow visiting Lana to ask her about something that happened. Lana tells them and we see a flashback of her trying to use Hydro Vortex, but in the middle of the attack Popplio gets dizzy and stops. Lana is unsure how she can improve this, however Ash reassures herthat if she practices enough then Popplio will do just fine. The group then hears cheering and look over to see some type of show going on nearby. They head there and find that a woman is putting on a show with her Brionne’s bubbles. Lana is astonished by how skilled the two are and watches with amazement. The woman finishes the show by directing everyone to her husband who is on a surfboard in the water. 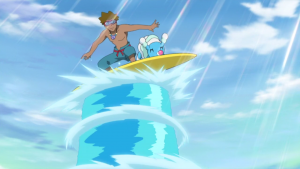 She begins a dance and soon her Brionne activates Hydro Vortex and launches her husband high in the air, garnering high appraise from the crowd. Lana sees this and walks straight up to the woman and asks to be her apprentice! A new way to hang ten! The woman is taken aback by this and unsure but her husband encourages her to help Lana out and so she accepts. She introduces herself as Aia and says training can start tomorrow. Lana learns that the two are from a sea tribe who train with water types to perform across the world. However while they do go around performing, they tell Lana that they are also treasure hunters! Unfortunately the woman tells Lana that her husband Kana has never actually found treasure, which is why she performs so they can earn money to eat. Kana assures them that he’s got a great lead and talks to them about a ship that sunk not to far from where they are now that had it’s whole cargo sink with it. Kana tells them that while they are here for a few days he will go search for it. In the meantime Lana begins her training. Lana is told to try and pop Aia’s Brionne’s bubbles by having Popplio using Bubble. For the first day Popplio is unsuccessful. However Popplio is able to pop the bubbles the next day after Aia tells Lana and Popplio that it takes a lot a practice and encouragement to learn Z-Moves and that Kana is the reason as to why she was able to master it. Before the training can finish, Kana interrupts everyone after coming back from hunting and tells them he found what he was looking for. The group asks what the treasure is and he says he believes it is a Mystic Water and if they want they can all head there tomorrow to help find it. Everyone agrees and so they depart the next morning. 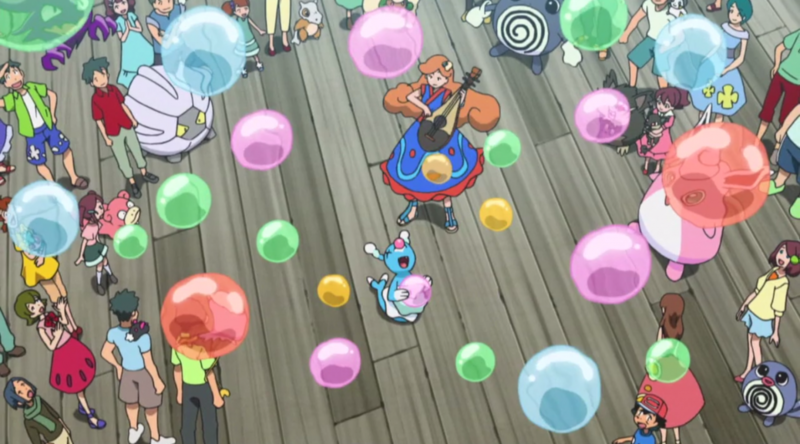 We learn that to get to the boat, Kana uses a bubble created by Brionne to breathe underwater. Brionne then pushes Kana down to the boat while he is in the bubble. Lana is impressed by these skills as it’s always been a dream of hers to explore the ocean in a bubble with Popplio. When Kana reaches the boat, he sees a Dhelmise is guarding it and heads back so they can figure out how to approach it. While they think over the situation, Team Rocket show up in a Bruxish submarine and encounter the Dhelmise who attacks their sub. They decided to tell it, that Ash and company sent them to do this and that they are very sorry. This is of course a distraction so they can take from the ship while Dhelmise attacks Ash and the group at the ship. Dhelmise tries to bring the ship down but Pikachu and Brionne attack it, causing it to let go of the ship. As Brionne heads back onto the boat, Dhelmise grabs and slams it onto the boat. A whirlpool is then formed and the boat begins to get sucked in. The whirpool attack begins to drag the boat down and even pulls in Team Rocket’s sub. Kana tells everyone that they won’t be able to escape due to the boat not being able to get out of the power of the whirlpool. Team Rocket is saved however when Bewear comes and frees the from the sub taking them away. Popplio’s Hydro Vortex washes Dhelmise away! Back on the boat Lana realizes their only option is to counter the whirlpool with another whirlpool. Aia asks if Lana thinks she can pull it off and Lana assures her that they can. Popplio goes into the water and manages to successfully use Hydro Vortex! This creates a force strong enough to repel the whirlpool created by Dhelmise and sends it flying into the ocean depths. Everyone congrats Lana on mastering her Z-Move and then Kana heads down to the boat and returns with the Mystic Water. He then gifts it to Aia to thank her for always doing work to support them. The gang heads back to the town and Lana thanks Aia for her help. Aia says that she hopes to see Lana again to see how much she has grown. 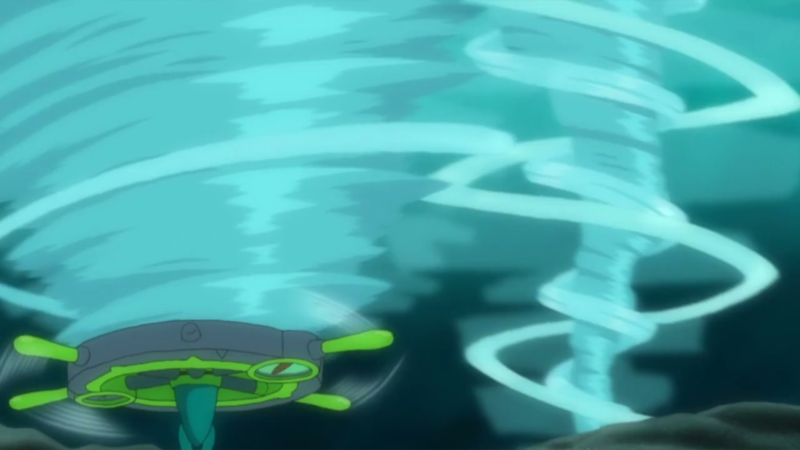 The episode ends with a shot of Dhelmise taking Team Rocket’s submarine to use as a home. That’s all for this week! What did you think of the episode? Be sure to join us next time for a the Chargabug race!